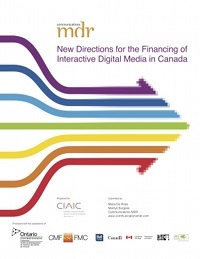 The Canadian Interactive Alliance / L’alliance interactive canadienne (CIAIC) releases Monetizing Digital Media: Trends, Key Insights and Strategies that Work, an examination of recent trends and key models being used to monetize digital media content. The study was conducted by Communications MDR and authored by Maria De Rosa and Marilyn Burgess, with the support of the Canada Media Fund (CMF), the Ontario Media Development Corporation (OMDC), the Bell Fund, the National Film Board (NFB) and the Department of Canadian Heritage. Integrating key insights by industry leaders and examples of successful monetization models and strategies being used by Canadian companies, the report provides an overview and analysis of recent global trends and key models being used to monetize digital media content. As stated in the report, digital media are being monetized in a rapidly evolving and complex ecosystem requiring a sophisticated understanding of consumer behaviour as well as an appetite for experimentation and risk. “Understanding the opportunities and challenges afforded by different monetization models is critical for companies to succeed today in increasingly competitive and global markets,” said Serge Landry, Executive Director of the CIAIC. The study is intended to provide Canadian digital media companies with strategic information as they seek to monetize their content across multiple platforms and in an increasing number of markets worldwide. The authors focused primarily on games and applications but the report also provides an overview on monetization opportunities for convergent content which is produced as an extension, or in relation to a television program. The Canadian Interactive Alliance / L’alliance interactive canadienne (CIAIC) CIAIC is a national not-for-profit association and the voice for Canada’s interactive digital media industry nationally. Founded in 2005, the CIAIC represents nearly 1,000 companies working in and serving the interactive digital media industry from coast to coast. Its membership is comprised of seven provincial new media associations, including Interactive Ontario, DigitalBC, Digital Alberta, SaskInteractive, New Media Manitoba, Alliance numérique, and Interactive Media Association of Prince Edward Island and more recently two new associations in Newfoundland and Labrador and in Nova Scotia have joined the CIAIC. The Canada Media Fund (CMF) fosters, develops, finances and promotes the production of Canadian content and applications for all audiovisual media platforms. The CMF guides Canadian content towards a competitive global environment by fostering industry innovation, rewarding success, enabling a diversity of voice and promoting access to content through public and private sector partnerships. Please visit http://www.cmf-fmc.ca.